Energy Customers Can See Live Demonstrations of the Joint Solution at Energy Drone Coalition Summit, June 20-21, 2018 in Houston, TX. HAMPTON, Va. and AUSTIN, Texas, June 19, 2018 /PRNewswire/ -- Ardenna and HUVRdata, who announced a collaboration in April to integrate their respective capabilities into one platform, are excited to reveal a groundbreaking joint solution that provides fully automated defect detection, reporting and analytics to the energy sector. This enhanced platform unites Ardenna's AI-based automated defect detection software with HUVR's Automation and Enterprise Industrial Asset Management Reporting and Analytic toolset to provide customers with a state-of-the-art solution for industrial asset inspections. Industrial customers using HUVRdata's platform already enjoy valuable efficiencies and benefits afforded by the unique combination of features offered in the platform, which include the storage of inspection data from disparate sources in a structured and secure database, customer-defined inspection checklists and report formats, comprehensive diagnostic analytics, and business system integrations. The integration of Ardenna's software further enhances the platform by automating the defect detection process and automated defect labeling. 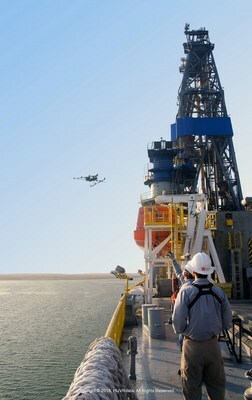 There are three main challenges enterprise asset owners face when integrating drones into their O&M work flows: (1) incorporating data from multiple disparate sources in a way that meets IT security, scaling and access requirements, (2) reducing data review time and minimizing human error, and (3) Integrating the reporting /analytics within existing business systems. Industrial customers using HUVRdata's platform already enjoy valuable efficiencies and benefits afforded by its unique combination of features, which address the majority the above outlined challenges, but the integration of Ardenna's software completes the solution by automating the defect detection process, including automated defect and client labeling. "The HUVR / Ardenna solution will bring leading edge technologies to the energy sector offering our clients opportunities to enjoy immediate ROI, automation and efficiencies in their inspection O&M workflows", said Ben Williams, HUVRdata Co-Founder. "Enterprise customers are integrating new methods of data capture, such as by drone, into the O&M workflow as a way to improve worker safety and supplement the types of information being collected on their assets", said David Patterson, Ardenna's Director of Business Development. "By integrating our automated defect detection capabilities into HUVR's platform, O&M groups within Enterprise organizations are able to leverage these new data capture methodologies in a timely and cost-effective manner". The companies will be featuring a demonstration of this combined offering at the Energy Drone Coalition Summit, June 20-21, 2018 in Houston, TX and will be looking to engage 3 lead customers for early access to these transformative technologies. Visit Ardenna and HUVRdata at booths 1102 and 1104, respectively, to learn more about the engagement offering and the benefits of leveraging this platform for your infrastructure inspection needs. Visit us at Energy Drone Coalition Summit, June 20-21, 2018 in Houston, TX, Booths 1102/1104.